I started this project and website in 2010 as a result of an extreme personal challenge I started in December 2009. I had a ‘year without clothes shopping’ from December 15, 2009 to December 15, 2010 and in short: that year changed my life. It changed how I think about consumption, especially for clothing. It changed how I feel about shopping (I can’t imagine wanting to spend a day at the mall now). And it changed how I applied my talents and what I did with my time. During my ‘year’, I became fascinated with consumption – how we do it, why we do it, and the consequences of our shopping behaviour. 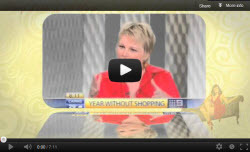 Click on the image to watch Jill talk about her “My Year Without Clothes Shopping" project. As a result of my fascination and a lot of research conducted during my ‘year’, I was inspired to create the My Year Without Clothes Shopping Program. This was a highly creative and challenging project – to design a 12 month curriculum and membership program for women, just like me, struggling with their shopping habits. We were fortunate that the program was immediately well received and started attracting members the first week it was launched. The program remains the world’s first online membership program for women who shop too much and want to stop. We attract members from all over the world and all walks of life. I was fortunate in attracting a faculty of 15 global experts in their own fields (finance, psychology, image, colour & style, sustainable style, mindset, professional organization) to contribute key content in their fields of expertise, within the program design that I created. This project also contains the shorter course: the Conscious Clothes Shopping 6 Week Mini Course. The mini course is designed for women who wear and shop for clothes, accessories and other appearance-related items, and who are interested in exploring (and improving) their relationship to shopping. This project quickly attracted a lot of media attention and continues to do so. I have become a recognised expert in the field of shopping and over-consumption and am regularly asked to contribute to media stories in Australia and increasingly in other countries, as well as being asked to share my story, speak at conferences and participate in panel discussions about conscious consumption in our modern consumer age. Click here to learn more about the My Year Without Clothes Shopping Project.